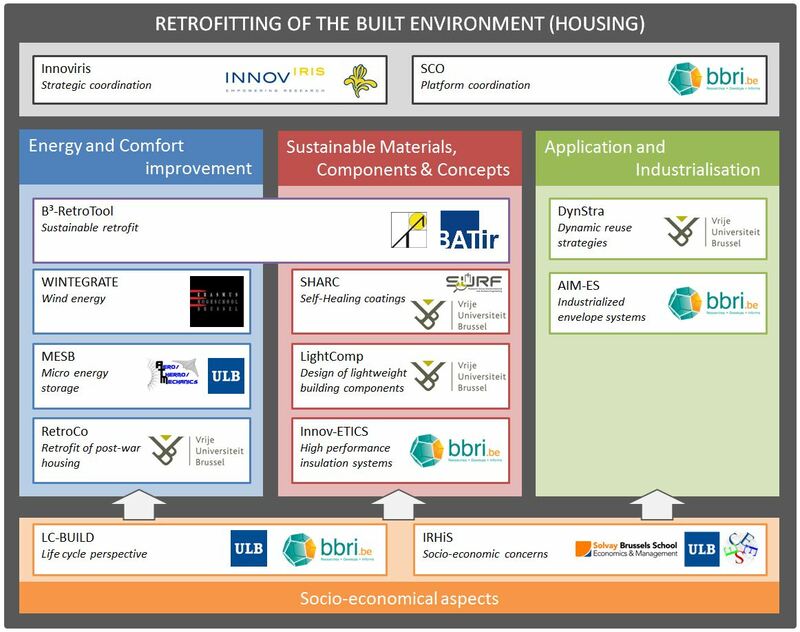 The global project « Brussels Retrofit XL – Retrofitting of the Built Environment (housing) », funded by Innoviris, takes the form of a project platform coordinated by the BBRI (Belgian Building Research Institute) bringing together research projects being conducted by different partner institutions. Strategic coordinator of the platform: Innoviris (Brussels Institute for Research and Innovation) prepares, evaluates, manages and finances the Strategic Platform Environment 2012. Platform coordinator (PC): BBRI (Belgian Building Research Institute) established a platform in cooperation with the selected research units and manages the global platform activities. Partner projects: Research projects have been proposed by selected research units, focusing on one of more themes specified for the platform. Partner projects focus on research according to the themes specified for the platform both individually and through partner interactions. A special effort has been taken to optimise partner interactions between the partner projects.